A separate ticket purchase is REQUIRED this year for entrance to the After Party. Purchase yours today for $15! 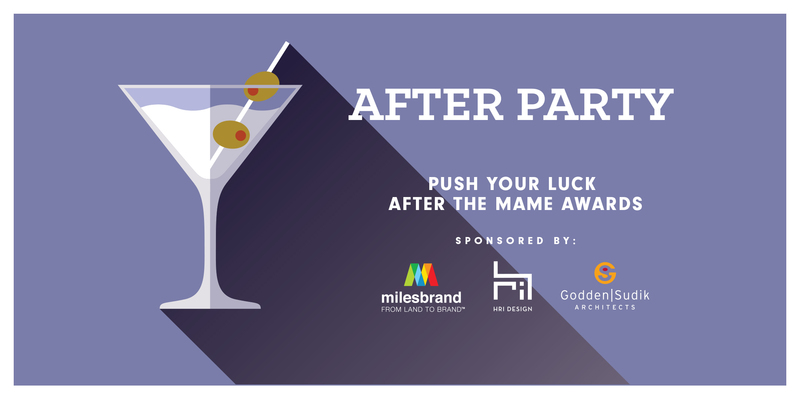 After the awards are over, head downstairs to keep the good times rolling at the MAME After Party sponsored by HRI Design, Milesbrand, and Godden Sudik Architects. This year’s bash will be in the lobby, so continuing your luck at the after party will only be an escalator or elevator ride away! A SEPARATE TICKET IS REQUIRED FOR ADMITTANCE TO THE AFTER PARTY THIS YEAR. TICKETS NEED TO BE PURCHASED IN ADVANCE. THEY CANNOT BE PURCHASED AT THE DOOR.